Over medium-low heat, sautÃ© the garlic in olive olive. Add a few splashes of red wine and a few shakes of Spike (or a bit og salt) and cook until garlic is soft. 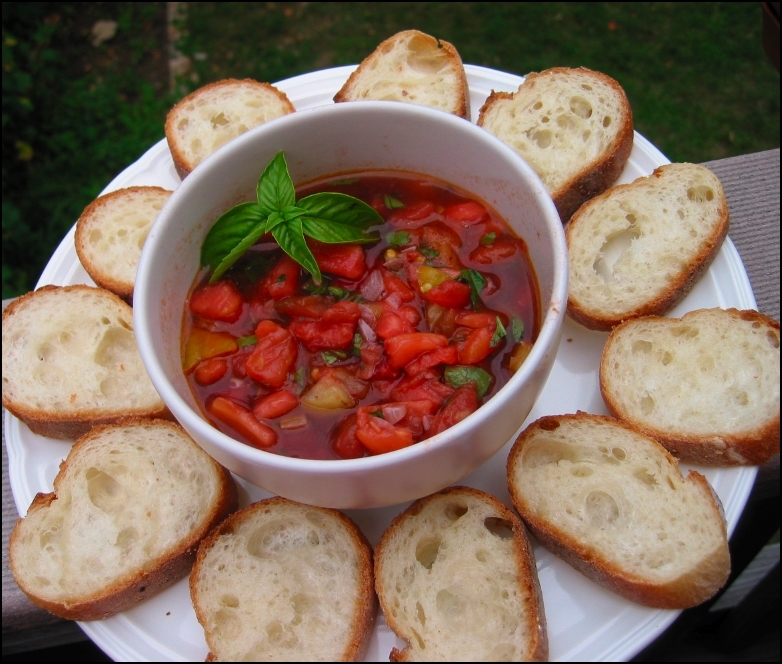 Turn down the heat and add the tomatoes, stirring gently until they just begin to sweat (this will happen very quickly! ).Â Remove from heat and stir in the basil. It’s that simple. I love it warm or cold over toasted sliced of crusty bread. Â You can also remove it from heat before adding the tomatoes, but I prefer them cooked just that teensy bit.Â Â You can drain off the liquid if you like and use it in something else but I soak it into the bread. Yum!